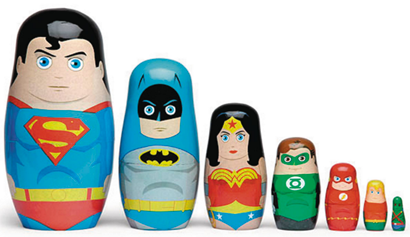 Check out this adorable set of Justice League nesting dolls! I would argue with the order of course, but let's stay positive. (I also think there should have been one more really teeny one of the Atom). Haha, yeah, it does seem like a missed opportunity for the Atom! I miss the Atom there too, but it's the founding 7 JLAers, so my OCD nerd issues are satisfied.